We've got hundreds of cats and dogs waiting to say Aloha to you this Saturday and Sunday during our FREE adoption weekend! 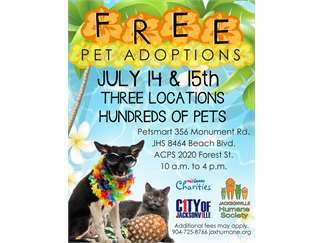 Stop by any of these three locations to find your new best friend: JHS 8464 Beach Blvd. Jacksonville, FL 32216 PetSmart- Regency 356 Monument Rd Jacksonville, FL 32225 ACPS 2020 Forest St. Jacksonville, FL 32204 All animals come spayed/neutered, microchipped and vaccinated. Additional fees may apply. Visit jaxhumane.org for more information. Cost: Additional fees may apply upon adoption.